Are you thinking of a tour of Hearst Castle on the Central California coast? It’s one of the most popular California State Parks. Hearst Castle is a massive mansion built on the top of a mountain in San Simeon, California. 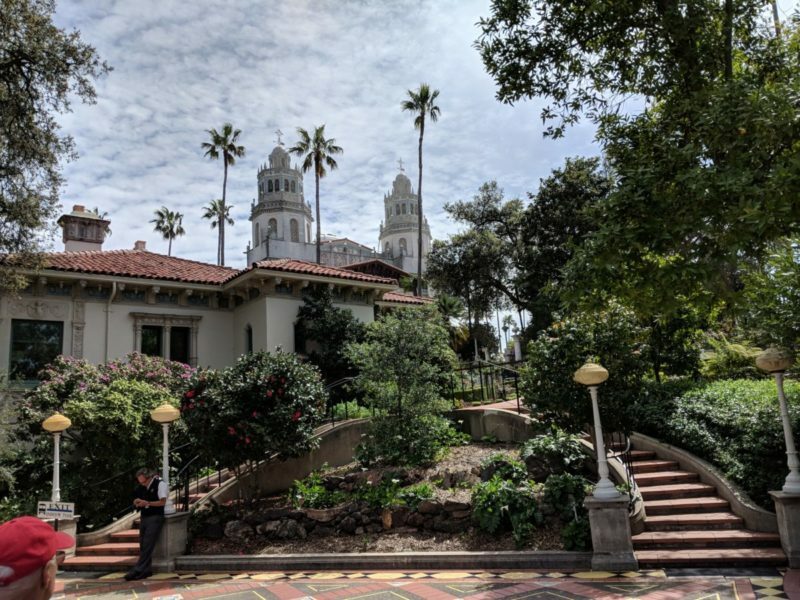 It was built and added onto through the 1920’s, 30’s and 40’s by the prominent newspaper publisher William Randolph Hearst, who filled it with his priceless art collection from around the globe. William Randolph Hearst frequently entertained the rich and famous at Hearst Castle. Hollywood stars were regular guests, and our tour guide told us that the Hearst family and some A-List celebrities still spend time at the house. Fun fact: my great-grandmother – who dated a California millionaire for a time – was once a guest at Hearst Castle in its heyday. We enjoyed our visit to Hearst Castle, but there are some things I would do differently if I were to go back. Here are my tips for visiting Hearst Castle. Reservations are recommended at Hearst Castle. You’ll pay an extra $8 per ticket for online reservations, which is annoying. However, Hearst Castle is located in a rural area on the Central California Coast. We didn’t want to drive there and not get a tour, or wait for a long time, so we chose the sure thing and we don’t regret it. We were able to get four tickets a day or two in advance with no problem. We spent about three hours at Hearst Castle. I would have liked to stay longer. My 11-year-old thought we stayed too long. Plan for a minimum of two hours, which will not allow much time for the visitor center or exploring the grounds. I underestimated how much time I would want before and after the tour. We arrived at the visitor center just in time to pick up our tickets and get on the bus. Then we rushed back to the visitor center instead of exploring the grounds because we were hungry for lunch. If I were to do it again, I would have scheduled the tour about 2 hours after our arrival. That would have given me time to look through the visitor center exhibits and gift shop, see the movie and eat lunch before our tour. We did all these things after the tour, and it was OK, but it felt a little backward. With full stomachs, and a better understanding of the history of the home and the man behind it, I would have enjoyed walking around the grounds after the tour. Hearst Castle has a large visitor center where you will park, pick up your tickets and catch the bus up to Hearst Castle. You’ll find museum exhibits, a movie, food court and gift shop. It costs nothing to experience the visitor center, so if your time or budget are too tight for a tour, you can still see Hearst Castle from a distance and learn a lot about it and the Hearst family at the visitor center. Hearst Castle: Building the Dream is the movie that is shown at the visitor center every 45 minutes. The movie is included in your Hearst Castle tour, or you can purchase admission on its own. It’s shown on a big screen with stadium seating. I enjoyed it. You can see the movie before or after your tour. There are several tours of Hearst Castle. The official website recommends the Grand Rooms Tour for first-timers, so that’s the tour we took. Other tours will take you through other parts of the house, and you can book them back-to-back if you’d like. You’ll ride the winding road to the top of the mountain on a tour bus, with recorded narration by Alex Trebek. Hearst imported animals from all over the world and you may spot zebras on your way to the top of the mountain. The 60-minute Grand Rooms Tour includes the Assembly Room, Refectory, Billiard Room, Theater, Gardens, Neptune Pool and Roman Pool. It’s just a small portion of the house, but very impressive and about the right amount of time. Our guide did a good job of keeping the tour interesting, but it wasn’t especially geared toward kids. I was wowed by all the art that William Randolph Hearst collected from all over the world. Ceilings, floors, tapestries, facades, sculptures and many more of the building materials and furnishings are priceless antiques. Visitors must stay on designated paths inside and outside Hearst Castle. My 13-year-old daughter loved the tour. She’s into history, art, Hollywood and Instagram, and Hearst Castle fits that bill perfectly. My 11-year-old son was not excited to visit Hearst Castle, and did not love the tour. He was a good sport and “took one for the team.” There were several families on our tour with school-age children and teens, and they all seemed to do well. You can enjoy the beautiful grounds around Hearst Castle for as long as you’d like before you take any bus back to the visitor center. On clear days you’ll enjoy panoramic views of the Pacific Ocean and the Central California coastline. The visitor center has a small food court, Chief’s Galley Cafe, which serves a diverse array of international cuisine that worked for the diabetic, the vegetarian, and the kid who only eats cheeseburgers in my family. It was convenient, with ample portions. It features local beef from Hearst Ranch. Entrees were about $10-15 each. There is also a coffee shop and a seasonal outdoor BBQ. There are several small towns nearby with restaurants. Sebastian’s General Store was on our list, but we didn’t make it. You could also bring a picnic. There is indoor and outdoor seating at the visitor center. Be sure to see the elephant seal colony about five miles north of Hearst Castle, either before or after your visit. Hundreds of elephant seals hang out on the beach year-round and visitors can safely see them from a boardwalk above the beach. We did this before our tour, and it was a highlight of the trip for me. Morro Bay is located about 30 miles south of Hearst Castle. This fun coastal town was our base for this trip, and it’s an excellent place to see otters in the wild. Click the button to learn more about our experience in Morro Bay. Where: Along Highway 1 in San Simeon, California. It’s on the coast, about halfway between San Francisco and Los Angeles. When: Open year-round. Closed on Thanksgiving Day, Christmas Day and New Year’s Day. How Much: Tour tickets start at $25 per adult and $12 per child (ages 5-12). Add $8 per ticket for online reservations, which are recommended. There is no charge to enjoy the Visitor Center. How Long: 2-4 hours. For the price, I think 2 hours is not enough time to get the full experience. 3-4 hours will be about right for most. Amenities: Most amenities, including food service and gift shop are located at the visitor center.